Three 20" Big Blue Housings which are plumbed in series with a wall mounting bracket and hardware for a clean and professional looking installation. The system consists of a series of large capacity 1" ported 20" Big Blue housings allowing for greater cartridge capacities and higher flow rates. Each system is also equipped with a pressure relief button to relieve housing pressure during cartridge changes. All filter housings are manufactured of a durable polypropylene, have excellent chemical resistance and are ideal for many residential, commercial and industrial applications. 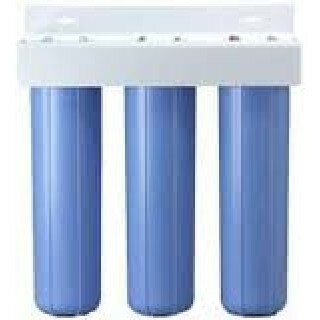 The housings will fit all Culligan, Ametek, Pentek, US Filter, Plymouth Products, American Plumber, and other filter cartridges that use 20" x 4.5" Big Blue/Full Flow filters. 20" 5 micron pre-filter, 20" Iron Reduction Filter and 20" carbon block filter: Pre-filtration followed by iron removal and carbon to polish. 20" 50 micron pre-filter, 20" 20 micron filter, 20" 5 Micron filter: Heavy/bigger sediment trapped by 50 micron, 20 micron to further polish water and finally 5 Micron. The combination options are endless and depends on your water chemistry. Please call Vitasalus Technical Support @ 877-284-5042 to determine best setup. The housings come with a pressure relief button and the kit includes bracket and mounting hardware. Some assembly required, does not ship pre-assembled to better ensure safer delivery of components.